This report highlights the prevailing real estate trends shaping the Los Angeles market for each neighborhood. Single family inventory levels rose to 1,402 listings as of the close of Q4-2018*, an 11% increase over Q4-2017 (YoY). The largest proportion of single family inventory is located in Sunset Strip-Hollywood Hills, where 230 homes are currently listed, an increase of 7% YoY. Across the neighborhoods covered in this report, the number of listings increased most substantially in Hancock Park-Wilshire and Santa Monica to 78 and 69 available single family residences, respectively (+66% and +57% YoY), whereas Hollywood Hills East and Malibu saw a drop in inventory levels to 38 and 158 available residences, respectively (-12% and -10% YoY). Despite an influx of available listings, sellers increased prices 4% YoY on a per-square-foot basis, asking $982/SF in Q4-2018. Absolute asking prices fell 4%, signaling that available residences are overall slightly smaller YoY. The largest decrease in absolute asking price occurred in Santa Monica, where the median asking price fell 43% YoY to $2.3M, much of which is due a reduction of nearly 1,200SF in average residence size. The Los Angeles single family market was characterized by fewer closings and an increase in days spent on the market in Q4-2018. 628 single family homes closed in Los Angeles this quarter (-11% YoY) at a median price of $2.1M (+1.6% YoY), a phenomenon that resulted partly from increasing mortgage rates. Most neighborhoods under Compass’ universe of coverage experienced decreases in the number of sales, particularly Sunset Strip-Hollywood Hills, where 59 homes closed this quarter, a 34% drop compared to Q4-2017. The number of closings also declined significantly in West Hollywood and Malibu, where 19 and 30 homes closed this quarter (-32% and -30%, respectively). By neighborhood, there were substantial swings in the median sales price, both positively and negatively year-over-year: prices rose in Malibu (+17% YoY to $3.2M) and fell in Beverly Hills and Santa Monica (-20% to $5M and -19% to $2.8M, respectively). The median valuation (PPSF) in Q4-2018 was $856/SF, a negligible decrease of 0.6% YoY. Valuations increased substantially in Malibu (+38% to $1,242/SF) and fell in Beverly Hills (-23% to $1,258/SF). Single family homes that sold in Q4-2018 spent 41 days on the market, a 14% increase YoY, driven in part by large increases in Century City-Westwood (+148% YoY to 39 days) and Malibu (+105% YoY to 160 days). On average, homes traded for 1.4% less than asking price, an increase in negotiability year-over-year, when the average sales price was 0.5% below asking. Although inventory levels climbed sharply in Q4-2018* – 593 condo units are currently available (+34% YoY), these rising inventory levels may be a sign of a healthy market adjustment. During the last few years, when supply was historically low, developers began construction of new development condos. Now, many of these projects are beginning to come to market resulting in a market-wide uptick in inventory levels. However, months of supply signals a still undersupplied market at 2.5 months. Many neighborhoods that saw inventory increases in Q4-2018 had new development come online in recent months. Availability increased dramatically in Beverly Center-Miracle Mile (+525% to 25 listings – although skewed by a small sample size), partially driven by the recent opening of a 14-unit building, One 32 Swall. Inventory levels also rose in Century City-Westwood (+45% YoY to 135 listings) and in West Hollywood (+63% YoY to 65 listings), where The Liddel, a 56-residence building in Century City-Westwood, and 1030 Kings, a 25-residence building in West Hollywood, recently began selling. The overall median asking price fell slightly YoY to $1.04M, however many neighborhoods saw large increases in asking price, including Santa Monica (+35% YoY to $1.9M), Pacific Palisades (+31% YoY to $800K), and Beverly Center-Miracle Mile (+31% YoY to $918K). On a per-square-foot basis, the overall asking price was $784/SF, a 3% increase YoY, demonstrating seller reluctance to reduce prices despite increasing supply. 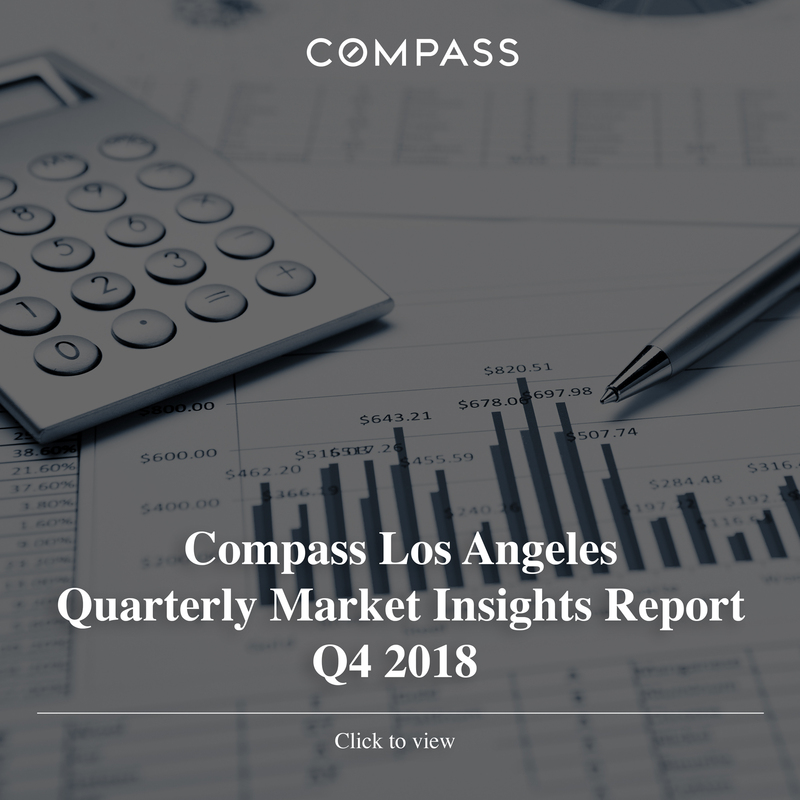 The number of condo sales in LA was down year-over-year in Q4-2018 with 537 closings, a 9% drop compared to Q4-2017; as would-be buyers are exhibiting patience in the marketplace. However, many neighborhoods with historically high sales activity did not experience major changes in the number of transactions; 99 condos closed in Century City-Westwood (+3% YoY), 89 condos closed in Pasadena (+5% YoY), and 78 condos closed in Santa Monica (-3% YoY). Conversely, closings in Downtown LA and West Hollywood, which also have had historically strong condo sales, were down year-over-year to 51 and 59 residences, respectively (-19% and -23% YoY). Despite the decline in number of closings, sales prices rose slightly to a median of $858K and a median price per square foot of $659/SF (+2.4% and +2.8% respectively, YoY). Most neighborhoods under Compass’ universe of coverage saw modest increases in valuations, but Los Feliz and Sunset Strip-Hollywood Hills experienced strong increases, up 30% YoY to $697/SF and up 22% YoY to $659/SF. Negotiability slipped in Q4-2019 to -0.4% below asking price, a change from Q4-2017 when condos traded for an average of 1.8% above asking price. If you specialize in a certain neighborhood, be sure to download the full report for submarket analysis. You can find all recent Quarterly Market Reports HERE.